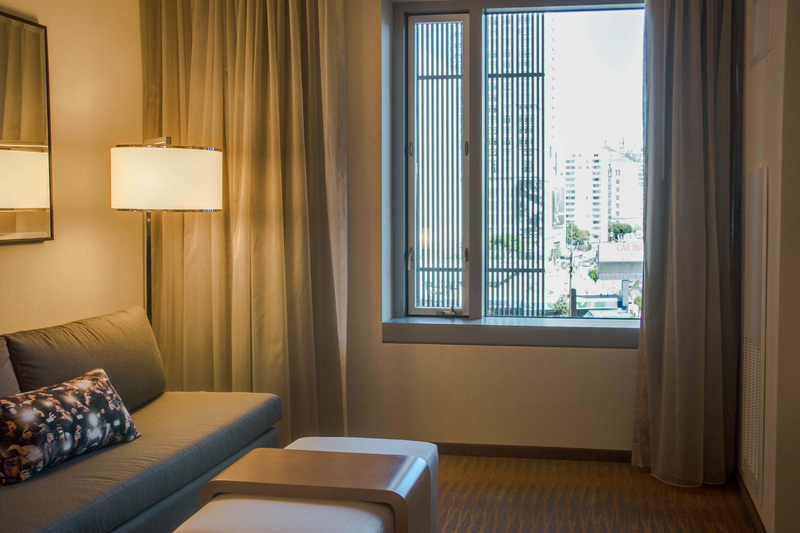 Overview: In downtown Los Angeles in July, Marriott introduced a co-branded, 24-story Courtyard and Residence Inn hotel. This is Marriott’s first co-branded property on the West Coast. (The first such dual-flagged hotel opened in New York in December.) Although the hotel is branded with two logos, they share a common lobby and front desk as well as all the common areas such as the pool and fitness room. 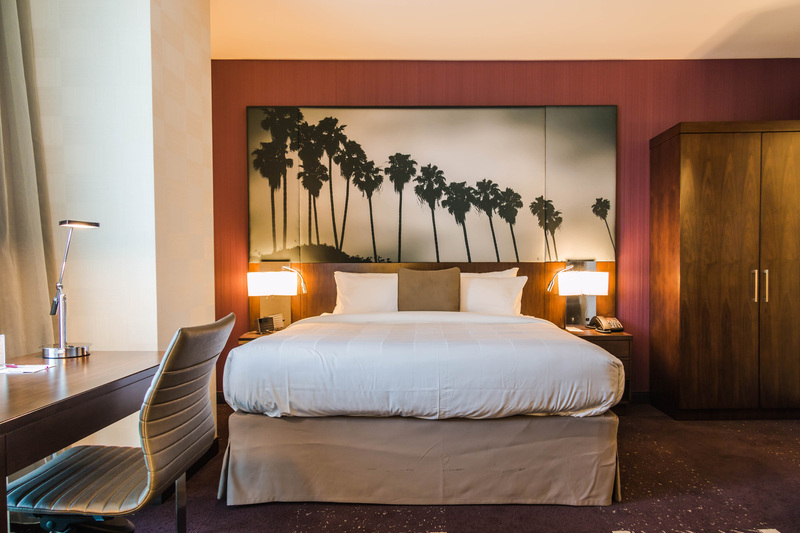 The location: The high-rise hotel – comprising 174 Courtyard rooms and 219 Residence Inn rooms – is across the street from L.A. Live and the parent company’s more upscale J.W. Marriott and Ritz-Carlton (which, incidentally, share a single building, but each maintains its own lobby and pool). 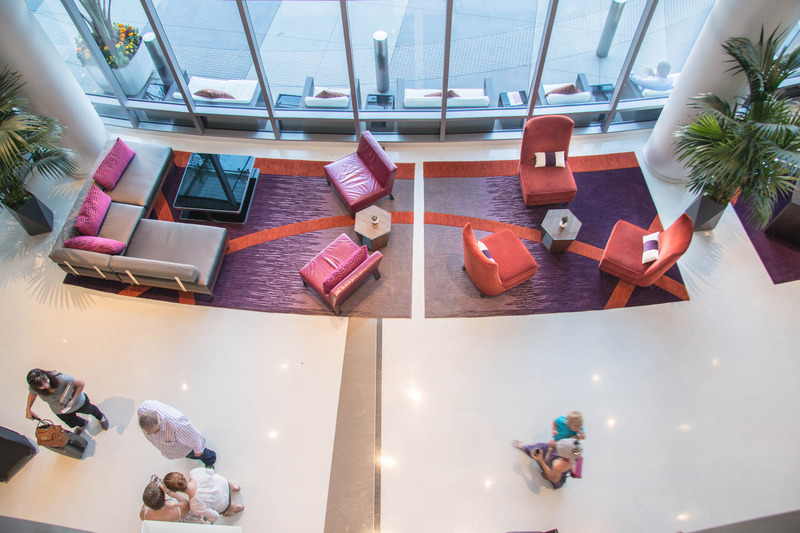 Public spaces: The common lobby is bright and airy, with a vibrant orange and purple color scheme that extends into the guest rooms and hallways. 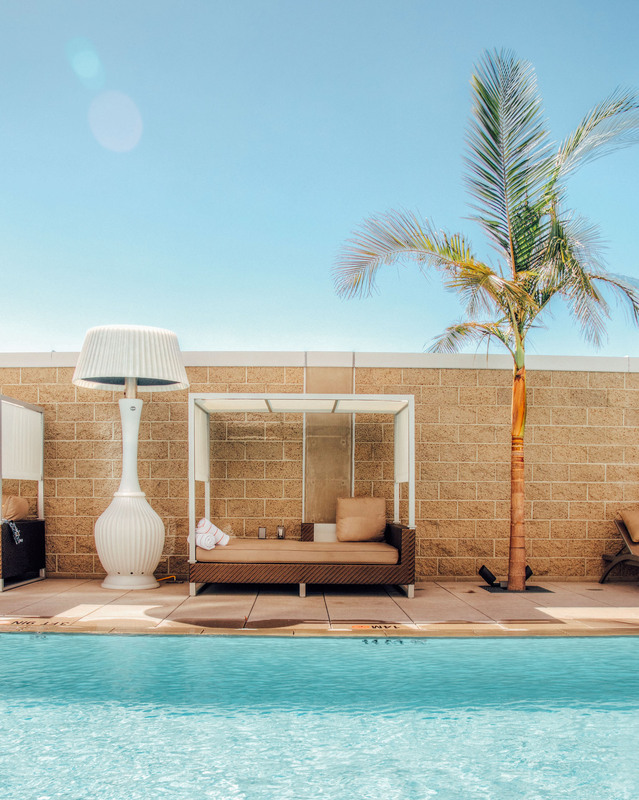 The pool is on a third-floor terrace, where cabanas and palm trees add a resort-like flair. A small but fairly comprehensive fitness room is stocked with clean towels, water and fresh fruit. 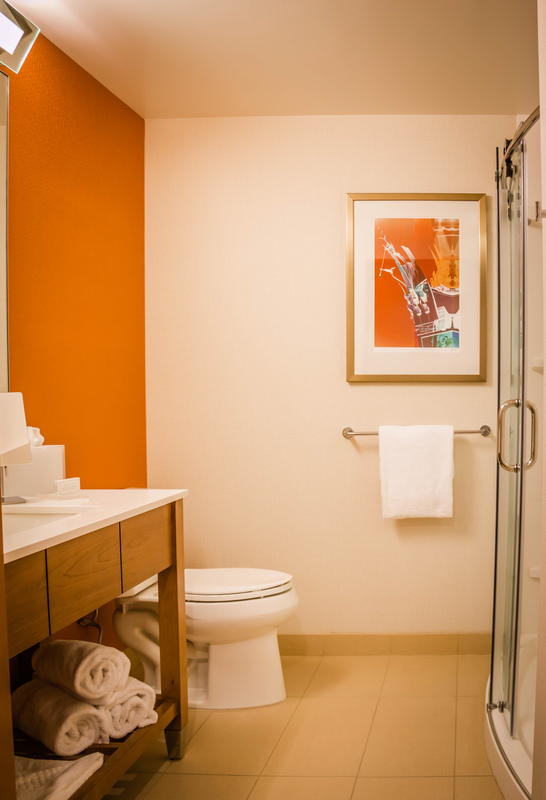 Most guest-room floors comprise both Courtyard and Residence Inn units. When you exit the elevators, you’ll notice orange carpet going in one direction, purple carpet going in the other. 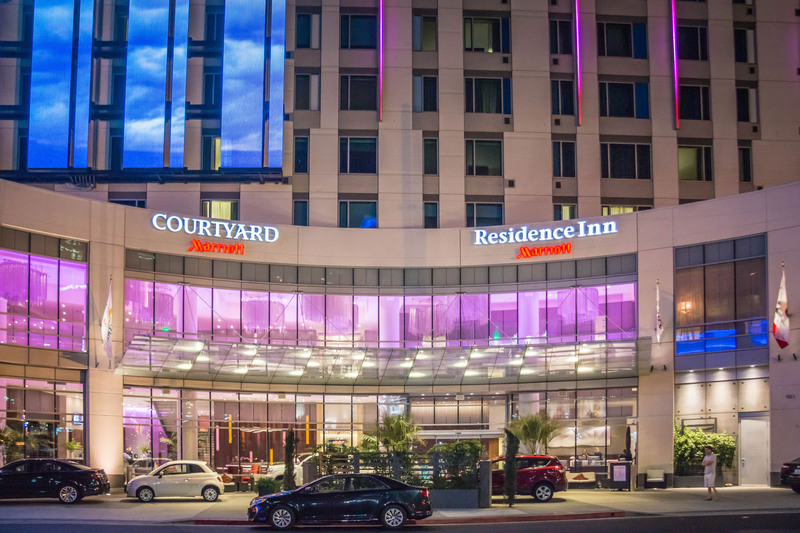 Orange hallways signify Courtyard, while purple represents Residence Inn. Service: Much of the front desk crew and valet staff came from the much fancier J.W. Marriott across the street, and they bring with them a level of sophistication and attention to detail that’s rarely seen at Marriott’s mid-range brands. Update: Having just stayed at the JW Marriott, I can say unequivocally that the service at the new Residence Inn/Courtyard is actually far superior to what I experienced at the JW across the street. Food/drink: The hotel’s street-side restaurant is still under construction, with no opening date in sight. 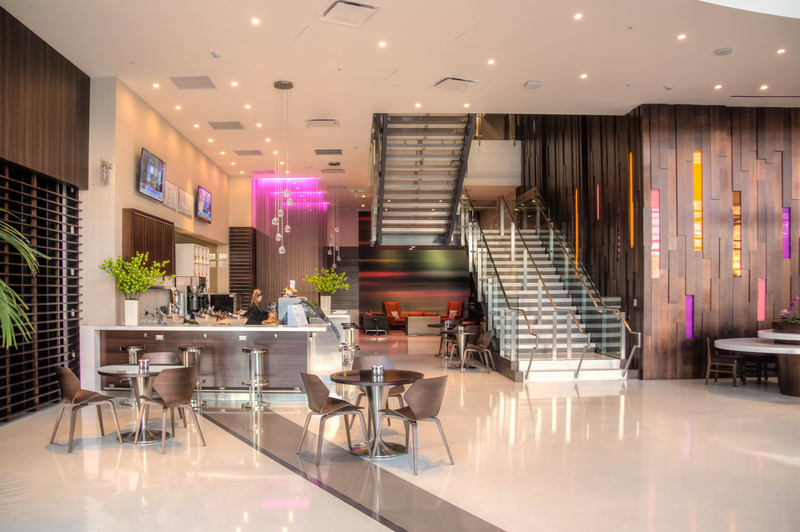 Meanwhile, guests with Residence Inn keys have access to a swanky club lounge on the second floor where complimentary breakfast is served, but it shuts down at promptly 10 a.m. Guests staying in the Courtyard rooms are not allowed in. 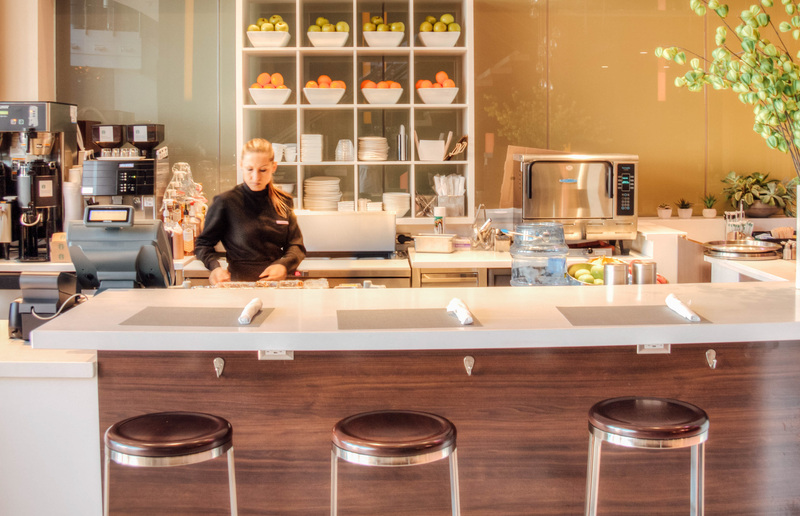 However, there is a small bar in the lobby that serves Starbucks coffee, breakfast pastries and grab-and-go items in the morning. Oddly, the bar closes after breakfast and doesn’t reopen until 7 p.m., focusing at nighttime on wine service. In the long hours in between, guests are directed to the restaurants across the street at L.A. Live. WiFi: Lightning-fast and free throughout the hotel. Courtyard room: No. 517 overlooks a parking lot, but it’s not a horrible view, with L.A. Live glittering in the background. The bedroom includes a comfortable seating area with a sofa and a good, tech-oriented desk with an abundance of electrical outlets and USB ports. 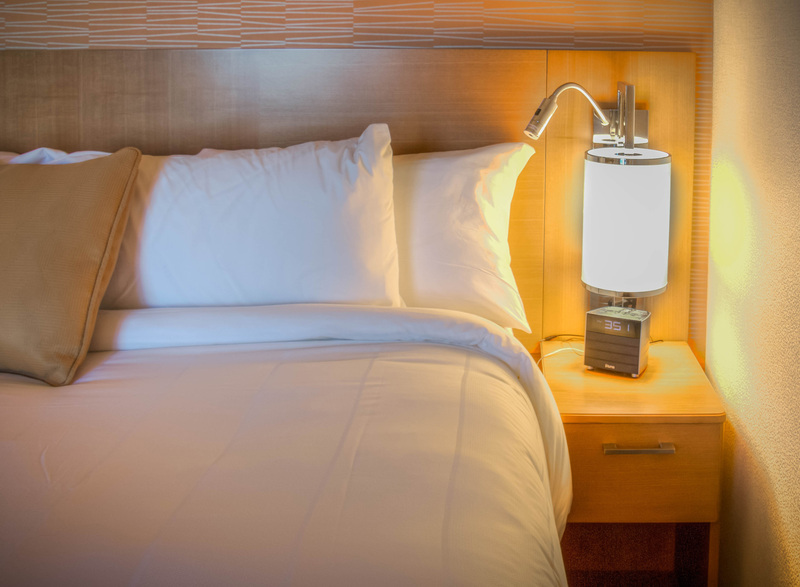 The bed and pillows are comfortable, outfitted with reputable linens. The large bathroom has a single sink and a shower big enough for two or three people. Paul Mitchell bath products are a nice touch. Residence Inn room: No. 2315 offers a stunning panoramic view of downtown. (The top two floors are reserved exclusively for Residence Inn.) 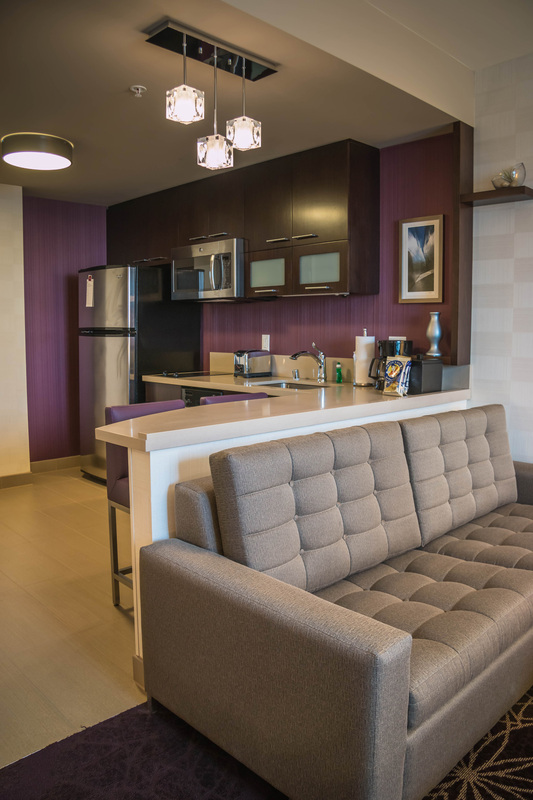 The room includes a nicely appointed kitchenette and a spacious living area with a similar desk workspace and more closet space. The bedding appears identical to what was in the Courtyard room. The bathroom is even larger, with a double vanity. Cost: $199 for the Courtyard, $219 for the Residence Inn, plus tax and parking. Parking is $42. Bottom line: Given that the hotel’s restaurant isn’t yet open, I would recommend the Residence Inn over the Courtyard if, like me, you wake up hungry. The complimentary breakfast and coffee are easily worth the extra $20, and the rooms are much bigger, too. Still, I believe both brands at this address are much nicer than the typical stand-alone Courtyard or Residence Inn. And the stellar service alone is enough to make me want to stay here again.